Reclaimed Serving Tray from Old Barrels Stave. Made in the USA from recycled wine barrel staves and bands. The elegant and rustic way to server at your next party or get together. Please note: Each tray is hand-made and no two are alike. Dimensions: 3" H X 15" W X 23 D. Hand-made From Reclaimed Wine Barrels. 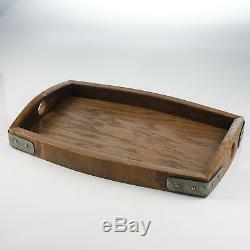 Great Tray for Serving Your Favorite Foods and Beverages Atop Your Ottoman or Coffee Table. Makes a Unique and Sophisticated Gift. Made in United States Amerika. The item "Reclaimed Serving Tray from Old Barrels Stave" is in sale since Thursday, September 28, 2017. This item is in the category "Home & Garden\Kitchen, Dining & Bar\Dinnerware & Serving Dishes\Trays". The seller is "giftsplaza-usa" and is located in Brooklyn, New York. This item can be shipped to United States, Canada, United Kingdom, Denmark, Romania, Slovakia, Bulgaria, Czech republic, Finland, Hungary, Latvia, Lithuania, Malta, Estonia, Australia, Greece, Portugal, Cyprus, Slovenia, Japan, China, Sweden, South Korea, Indonesia, Taiwan, South africa, Belgium, France, Hong Kong, Ireland, Netherlands, Poland, Spain, Italy, Germany, Austria, Russian federation, Israel, Mexico, New Zealand, Philippines, Singapore, Switzerland, Norway, Saudi arabia, Ukraine, United arab emirates, Qatar, Kuwait, Bahrain, Croatia, Malaysia, Brazil, Chile, Colombia, Costa rica, Dominican republic, Panama, Trinidad and tobago, Guatemala, El salvador, Honduras, Jamaica.